Tenacity, blood, sweat and tears were required to build your successful business. But when you outsource FINOP Services, you give up control. You give up exactly what you have worked so hard for – exactly what you need the most! We can show you how to obtain the benefits of outsourcing and enhancing control. Some outsourced FINOPs ask for your data and remotely run your back office. When there is a question you go to them for your financial and operational information. Or, you use QuickBooks and/or Excel. If you are not proficient with that software, you have to go to someone else for information to make decisions. Again, you have lost control. BDOS-FINOP Services is totally different. We provide BDOS software. You get total control and reduced costs. You provide a competent clerical person. We train you and your person to operate BDOS. The result is an extremely productive back office that you control. All your financial and operational information is available instantaneously. Since your information is automatically generated by our software, we can provide proper remote oversight and be confident of your results. Because you do most of the work, we can offer very competitive prices for BDOS-FINOP Services. If you do not download trades, you should start. If you manually enter trades to Excel, you should stop. 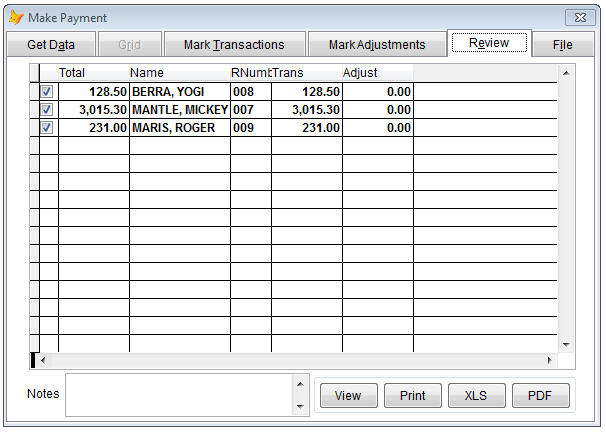 If you use QuickBooks to manually create general ledger entries you are spending too much time. Manual entry of back office data leads to errors and lost time in resolving them. We do not know what you do, but we can show you the best way to operate, manage and control your back office. rep payout (rep commission) of $303.20. When BDOS processes that trade, the following general journal entries are automatically generated. It is as easy as that, and BDOS does it automatically. BDOS reads the trade and does all the debiting and crediting. The time (and associated cost) involved with accounting software is eliminated. And, as noted earlier, BDOS can be operated by a competent clerical person. BDOS presents the trades for which it expects to receive payment. 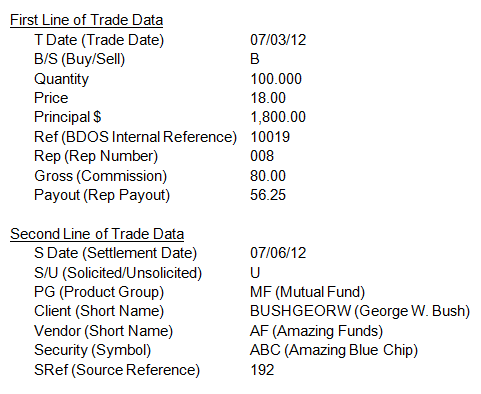 BDOS reference 1009 and the corresponding George W. Bush trade for 100 ABC @ $18.00 is shown below. 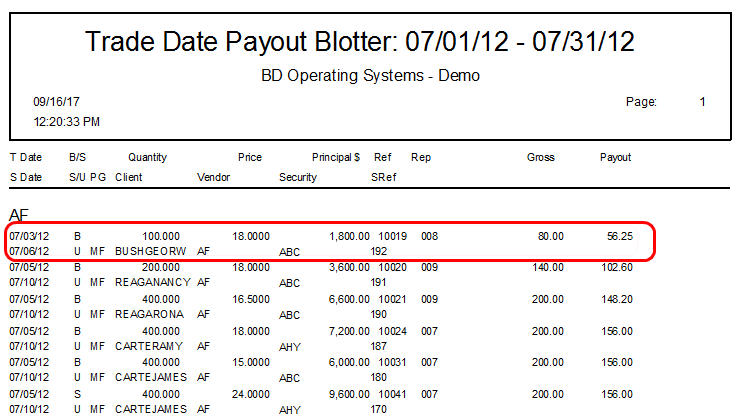 BDOS did a bunch of things while the user simply indicated the trades that were paid. Based upon the trades that were reconciled, BDOS expected $4,365.00. But, only $4,300.00 was received. As such, BDOS posted $4,300.00 to cash and reduced your receivables by $4,365.00. 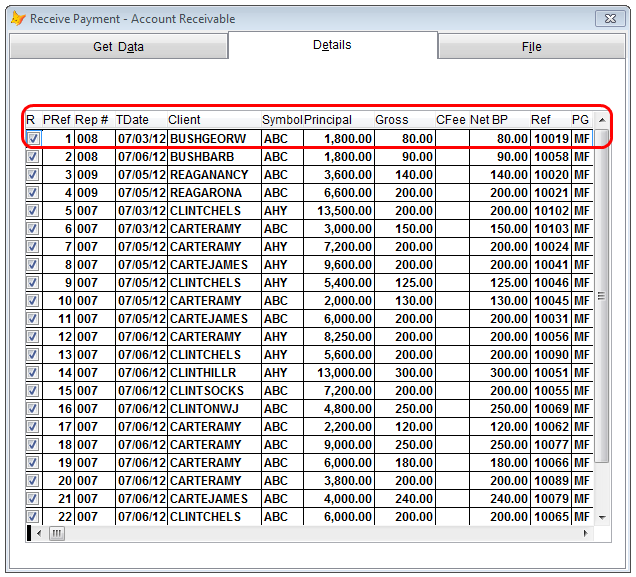 As of 08/05/12 you have no receivables from Amazing funds. Your records show you expected another $65.00. 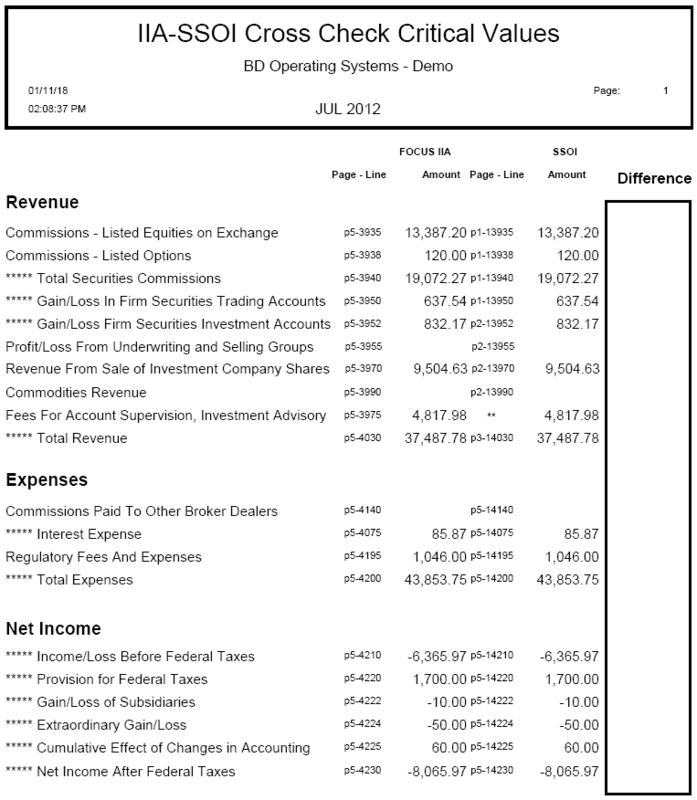 Since you did not receive the money, BDOS made an automatic revenue adjustment of $65.00. If something was incorrect in the original posting of the trade, you can correct the gross (commission) or rep payout while receiving payment. 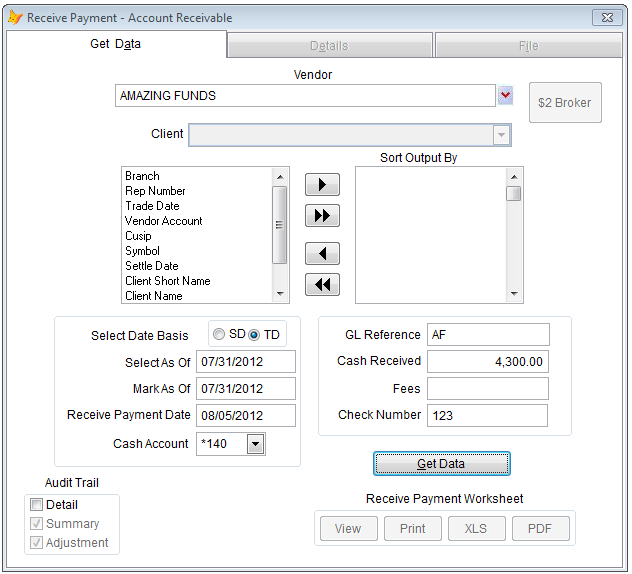 BDOS will automatically adjust the original revenue amount and change to the rep payout. The next step is to pay the reps. Just like Receive Payment, BDOS makes paying the reps a fast and easy process. You enter the current date, the pay period ending date and tell BDOS to “Get Data”. Details are shown for all the trades that are ready for payment. 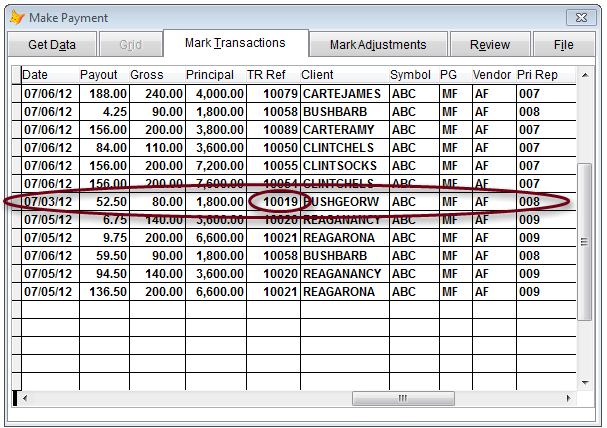 Trade reference 10019, the George W. Bush trade for 100 ABC @ $18.00 appears below. Before filing, review the total payout, trade payouts and non trade adjustments. 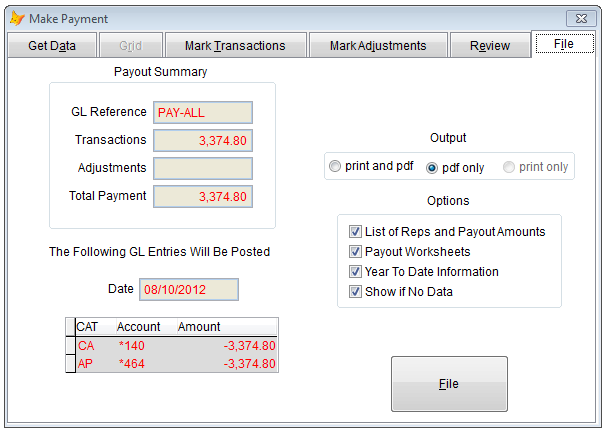 If the numbers look OK, go to the File tab, file the data and the payout process is done. 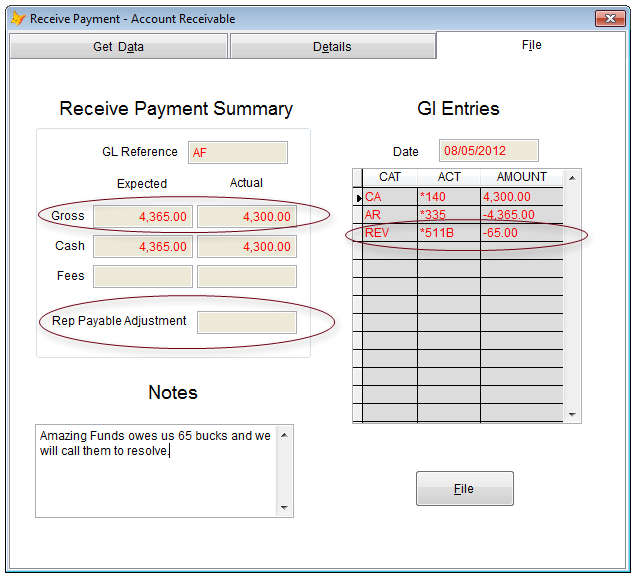 The trades were recorded, you received payment and paid the reps. BDOS made the process easy. Now you produce the monthly financial statements. 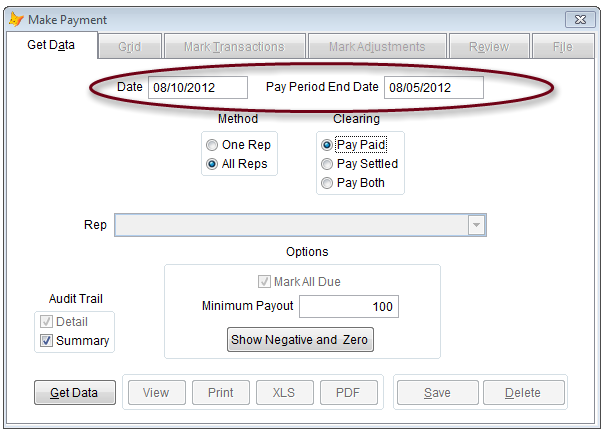 Indicate the month end date and click the “Close Month” button. 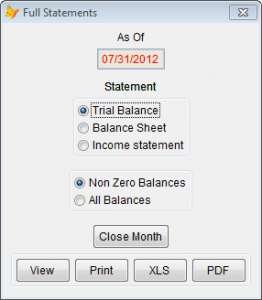 In seconds you produce the Trial Balance, Balance Sheet and Income Statement. 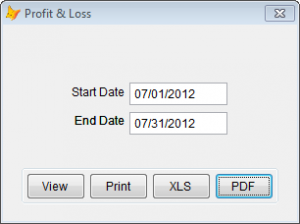 You can also generate a Profit and Loss Statement for any date range. Quarterly reports are as easy as the monthly financials. Tell BDOS the month ending and number of months in the report. The FOCUS IIA and SSOI are created in seconds. When no values are found in the cross check difference column you can be confident your reports are in order and ready to be filed. Now you can understand how BDOS and BDOS-FINOP Services enhances your back office operations. Through improved methods and efficiency you reduce costs. You, with the help of BDOS, do all the heavy lifting. As a result we can offer extremely competitive pricing for outsourced FINOP services. BDOS has provided precision results to broker dealers since 1989. Three of our current clients have used BDOS for over 25 years. We invite you to tour our site and our sister site, BDOS. To arrange for a demo presentation fill out the demo request form or call us at 919-321-0716, arrange a demo presentation.